Speak up, Move on or Take it! The choice is yours when it comes to being a dissatisfied customer. Ultimately the responsibility of a well-run grocery store starts at the top of the chain and trickles down but if policies and procedures aren’t met the customers will let them know. The problem is, not all customers voice their opinions to the right people or at all. Grocery store employees deal with a variety of difficult customers but then dealing with angry customers over important issues that must be dealt with right away. I find there is a difference between difficult and angry because being difficult means you want something to happen and angry is because something has happened and you want it fixed. 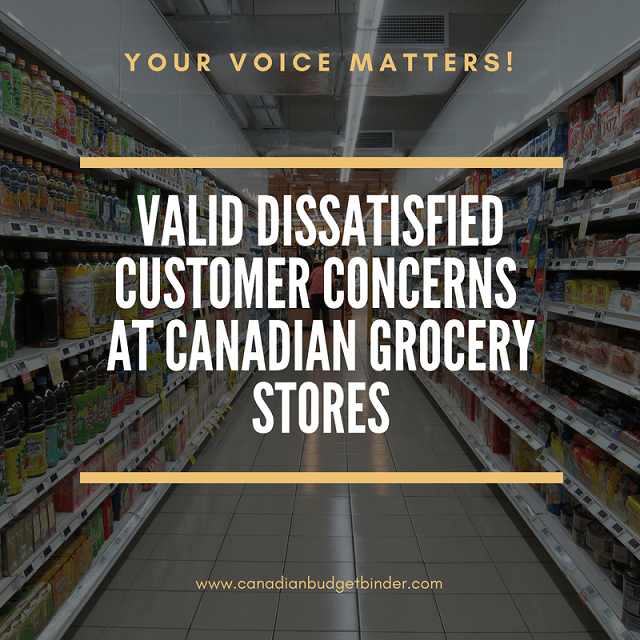 In any case customers often have valid concerns about the places they grocery shop at and I wanted to know from my readers what bothered them the most about our Canadian Grocery Stores. This isn’t a post to bash any particular grocery store rather it is a way to hear what the customers have to say. Most often customers won’t say a darn thing but they sure as hell think it. Ewe, Yuck, I won’t touch it, disgusting and all for valid reasons but just keep on trucking through the store buying what they want. As you will read below you may wonder what exactly quality products look like and when is the right time to let someone know that you are a dissatisfied customer. There really is no right or wrong time but there are obvious times as you will learn. If you see something you don’t like or are concerned about whether you are in the wrong or the store is, let them know. Most often management will listen but if not there are always other avenues you can take to find out if the store needs to step-up and fix their standard practices. The Scanning Code of Practice also known as SCOP for instance where grocery stores in Canada who participate want to know about incorrect pricing but perhaps don’t offer you the $10 off the item if over $10 or FREE if it’s under is reason to complain. If you ask your cashier to apply SCOP and they won’t and you have reason to believe you are correct you can ask a manager or read more at the Competition Bureau of Canada.You can then make a formal complaint and they will look into it if it is valid. I have to agree with Colleen on this one especially for huge promotional sales that grocery stores offer. I feel that the grocery store should put limits on items per customer even though they can go in and out and come day after day. In most cases this simple process may deter someone scooping the lot or more than their share. Also, the grocery store should know how much stock they are getting and to ensure that the customer is always informed. If a truck is late or if there are any other reasons why the shelf is empty make it someone’s job to put a note out for the customer and remind them to get a rain check if available or offer a re-stocking date. Knowing is better than not knowing for your customers. One of our dissatisfied customer complaints would be is seeing a dirty grocery store including the restrooms. As parents we’ve visited our fair share of bathrooms in our local grocery stores some of which are not monitored like they should be. Perhaps they are monitored but not being cleaned properly during the check-in phase or a boatload of foot traffic used the room with-in the hour messing it up. It’s also important for customers here to respect cleanliness and do their part. I also keep my eyes open for clean floors, counters, conveyor belt at the cash, bunkers, full-serve counters, bins etc. This is important to me and my family because if employees aren’t doing their job or if management isn’t enforcing the simple stuff who knows what else lurks behind the scenes that we can’t see. The hardest part for customers is comparing prices on products from one store to another only to realize just how much price difference there really is. Price mark-ups happen because each store is different and offers different services to customers which is why there is Zehrs a higher-end store and No Frills which is as the name states, simple. Where do grocery stores draw the line though? Prices on the same products from store to store widely vary and for those customers who grocery shop in small towns it’s a struggle to keep food on the table. The only option is to move or drive out of town to find better deals or shops that will price match to fit a grocery budget. Selection is important to customers which is why it’s important for grocery stores to make sure they have a wide variety of products available. No one likes to drive from store to store looking for products especially when they are common items. Some stores for example might not sell a certain brand but others will and if price-matching comes into play it’s impossible to do. I often find that the inexpensive labelled grocery stores such as Food Basics and No Frills offer a better variety and price on International products than their pricey sisters and brother shops but lack in health and beauty. The one-stop shop grocery store is popular to some customers for this reason but as Beth mentioned even places like Wal-Mart offer limited product selection. Based on that alone customers need to find the best grocery store that meets their needs and often that’s not an easy thing to do. I find that going to multiple grocery stores is the only way to get what we want and at a reasonable price. The moment I see something that doesn’t look good it turns me away from a store for good. My mind starts wondering why it’s happening and what processes are in place. Granted, mistakes happen but when you work in the food industry mistakes can come at the cost of a customers health and that’s a big no-no. Whether it be stale or mouldy product or the produce section is filled with fruits and vegetables that have seen better days customers simply won’t have it. It’s important that any grocery store take pride in what they sell whether the store is high-end or not. Canadians pay good money for the food they eat and expect that employees and store management will do their part to supply the best products available. The last thing any customer wants to see is product that should be refrigerated or frozen sitting in bunkers or refrigerators that aren’t working. Who wants to see deli meats or butchered product waiting for refrigeration? No one and you shouldn’t which is why customers expect grocery stores to take the safety and quality of their products seriously. If you notice something isn’t right let someone know in management right away so they can get the issue resolved. You can also report the grocery store to the Canadian Food Inspection Agency for any violations you think need to be investigated. I’ve seen birds flying around the grocery store hanging out on the ceiling beams which does bother me because they shouldn’t be in there. In any case rats, mice, raccoons, squirrels, cats or any pets (unless service pets), rodents or bugs/spiders that shouldn’t be in a store must be removed immediately. You can report a food safety complaint or label to the Canadian Food Inspection Agency but their website states that some things must be brought up at store level. However if you have other concerns such as food handling safety, dirty store or rodents running loose than most definitely you can inform the Canadian Food Inspection Agency. I’d also talk to the store manager as well to make sure they are informed of what is going on. Whether it be a small or large grocery shopping trip if I need to make my way to customer service for any reason the last thing I want to see is an empty service desk. I also don’t care to see that the cashier is running the fast-lane, customer service and lottery at the same time. I don’t want to wait forever to get served and if you offer customer service then make sure someone is there to serve customers in a timely manner or there is a LOUD bell. Consider for a moment that it’s not the customer complaining but rather another employee who witnesses the above mentioned. If management won’t do anything about it then perhaps letting the right people know is looking out for customer service. Food safety is big business and I don’t know about you but I sure as heck would want to know if I was a manager but often employees worry more for their job security or ratting out co-workers (no pun intended). Some employers have an anonymous complaint box where employees can write in without worry. This may be a great option for shops that want employee feedback. In part we are all responsible for cleanliness in grocery stores which is another topic I will be writing on next involving customers. With that in mind you are the customer and if you see something that falls with-in the above guidelines set out by the respective Canadian government agencies or the management team at the grocery store, tell them. Without knowing something is happening often it will go undetected. If you see the same thing over and over again such as a dirty washroom or shop floors then perhaps a call to head office is a better idea since simple things like this should be spotted right away. If you are a dissatisfied customer you will continue to be until you see results. Speak up, Move on or Take it! Choice is yours. Discussion: What other things can you think of that might turn you into a dissatisfied customer? Hey everyone the month of May grocery shopping ends this week with our last shop for May. It looks like we are over again which we expected would happen. Over the years we’ve learned that once you go over a shop it’s not easy to get back on track and it might take a couple of months to get there. That’s fine as long as you have the money you’ve sent over by and that you are tracking those numbers. Another good month. Lots of herbs on the way up at our house and of course rhubarb. Until next week my friends, enjoy this beautiful weather. Come this season we are extremely busy as well. This year in particular as you know has been nothing short of a nightmare for us but we’ve learned lots about death that’s for sure. My question is when you mention that you revamped your Will and PA does the lawyer charge you a fee? I think I might be looking into the watermelons soon as I guess or little guy was devouring it at daycare last week. It’s nice to know he eats a bit when he’s away from home. Whew! I must admit this is a lot of work! I fell behind this month but since I keep the receipts for my budgeting, I have them handy. I need to return to meal planning as I found that when I wasn’t doing it these last two months, I ended up eating a lot of instant stuff (canned soups, noodles, etc). Plus I can prep the ingredients beforehand (like thawing). Next week, I will have tuna pasta salad for lunch. Dinner, I will have spaghetti for 2-3 meals. I think I’ll also make mushroom rice after I finish with the spaghetti and serve it with either grilled steak or chicken. Grocery shopping when you aren’t feeling well is the pits. I know when I do I just want to get in and get out and I do it fast where normally I like to take my time to explore the store. I am struggling to get back on my feet again health-wise after the year end accounting, corporate and personal tax seasons, TFSA and RRSP contributions & investing… not to mention revamping our wills, PA’s and Representation Agreements. In addition, I’ve been running back and forth to a slew of medical and dental appointments for the last couple of months. It really was a pleasure to just park myself and enjoy the royal wedding on the TV on the long weekend. I feel like I need a vacation in the worst kind of way but we haven’t scheduled anything until the fall. Think I can hold out that long? This is a SMALL shopping week on the Canadian Side of the border! I had planned to buy more but when I stopped at Meridian Farm Market, I really didn’t like the look of their mini cucumbers so I put everything back & just left. It’s only a good price if the produce is good quality. I had planned to stop at No Frills as well but because I walked away from Meridian, No Frills wasn’t even open yet and we simply headed for home. I am transferring the $59.12 in unused grocery funds into the GGC Savings Reserve. OUR CURRENT TOTAL UNUSED RESERVES ARE $1,802.62. This means the 1,761.30 that we carried forward from 2017 PLUS AN ADDITIONAL $671.39 that we have added in 2018, LESS $630.07 that we have drawn out for use in 2018.